A spicy snack made up of various cereals, pretzels, crackers and mixed nuts. The spice comes from the seasoning we use. Besides tasting very good it is perfect to have on hand for entertaining or gift giving. Divide cereals, pretzels, crackers, and nuts evenly between the two roasting pans. Mix the spices and the oil in a blender making sure it is well blended. Pour the oil evenly over each roasting pan. Put the contents of one of the roasting pans in the bucket and cover with the lid. Rotate the bucket or container about 20 to 25 times. Pour the cereal contents back into the roasting pan and slide the roasting pan into the heated oven. Repeat the same procedure for the second roasting pan. Every 20 minutes remove each roasting pan, pour the contents into the bucket, cover with lid, and slowly rotate the contents 20 to 25 so that the seasoning is well distributed. After 2 hours, remove the roasting pans and let cool on cooling rack. 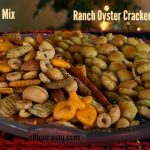 Once the party mix is cooled it can be stored in the 5 gallon bucket or container you used to mix it. Keep in a cool place and it can last quite a while -- ours never has.